Transparency Market Research (TMR) has published a new report titled, “Diagnostic Specialty Enzymes Market - Global Industry Analysis, Size, Share, Growth, Trends, and Forecast, 2018–2026”. According to the report, the global diagnostic specialty enzymes market was valued at US$ 686.2 Mn in 2017 and is projected to expand at a CAGR of 7.5% from 2018 to 2026. Increase in biotech & diagnostic applications and rise in prevalence of chronic, infectious, and lifestyle diseases are anticipated to fuel the growth of the global market from 2018 to 2026. The global diagnostic specialty enzymes market is driven by surge in investments, early and instant diagnosis, and increase in geriatric population in the developed countries. However, lack of customer education and adoption, and technical complex and niche nature are the major restraints of the global diagnostic specialty enzymes market. 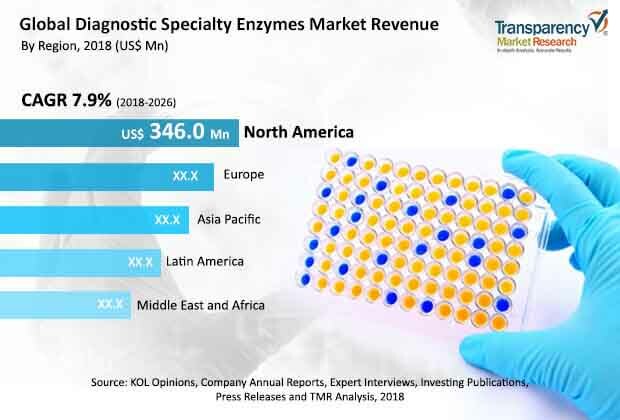 North America and Europe are projected to dominate the global diagnostic specialty enzymes market in the next few years owing to increase in manufacturer focus for business expansion in these regions. Players are continuously developing advanced products for diagnostic specialty enzymes and entering into distribution agreements to strengthen presence in North America and Europe. Rapidly growing biotechnology industry, increased disease prevalence and rising adoption of several strategies focusing on niche areas are some factors increasing demand for diagnostic specialty enzymes products, is likely to drive the Asia Pacific diagnostic specialty enzymes market. The diagnostic specialty enzymes market in Asia Pacific is expected to expand at a CAGR of 9% from 2018 to 2026. The report offers detailed segmentation of the global diagnostic specialty enzymes market based on product and application. In terms of product, the market has been segmented into carbohydrates, oxidases, polymerases and nucleases, protease, lipase and others. The polymerases and nucleases segment is poised to account for the leading share of the global market during the forecast period from 2018 to 2026. Higher share of the segment is attributed to increased usage of polymerase and nuclease enzymes in advanced biotech applications such as DNA sequencing and DNA amplification. The polymerase and nuclease segment is likely to expand at a higher growth rate in terms of revenue during the forecast period owing to continuous product innovation by major players. In terms of application, the clinical chemistry segment is projected to account for major share of the global diagnostic specialty enzymes market during the forecast period. The segment is likely to expand at a moderate CAGR from 2018 to 2026. Dominance of the segment is attributed to continuous innovations in diagnostic specialty enzymes and wide product portfolio of major as well as local manufacturers. For instance, in December 2016, BBI Solutions (BBI) announced the launch of Porcine Liver Esterase (PLE), a new enzyme for urinalysis. Continuous new product launches and rise in patient base in developed as well as developing countries are likely to drive the segment between 2018 and 2026. Data compiled from the CDC, the WHO, The American Heart Association, the International Diabetes Federation, and Partnership for a Healthier America indicated that 33.5% people in the U.S. suffer from high cholesterol and 387 million adults have diabetes, which cause about 17.3 million deaths per year. The immunoassay segment is projected to expand at a CAGR of 8.5% during the forecast period. The immunoassay and others segments accounted for 40% share of the global diagnostic specialty enzymes market in terms of revenue in 2017. In terms of revenue, North America dominated the global diagnostic specialty enzymes market in 2017. Increased demand for preventive health care and adoption of advanced diagnostic tools such as molecular diagnostics and point-of-care testing are likely to boost the growth of the diagnostic specialty enzymes market. Supportive reimbursement policies in the U.S. contributed to the leading share of the U.S. is also one of the factors contributing for major share of the North America market. However, technical and niche nature and lack of customer education and process adoption are likely to hamper the market. Health care spending in emerging markets such as China and India is rising. This fuels the growth of the diagnostic specialty enzymes market in Asia Pacific. Development of health care infrastructure, increase in population, growth of the biotechnology industry, and surge in burden of diseases necessitating diagnostics are likely to boost the growth of the market in in Latin America from 2018 to 2026. The report also provide profiles of leading players operating in the global diagnostic specialty enzymes market. F. Hoffmann-La Roche Ltd., Codexis, Inc., Amano Enzymes Inc., Biocatalysts Ltd., and Advanced Enzymes Technologies Ltd. are the major players operating in the market, offering wide range of diagnostic specialty enzymes. Codexis, Inc. offers advanced diagnostic specialty enzymes. Expansion of diagnostic specialty enzymes product portfolio through partnerships to improve efficacy and quality is a rising trend in the global diagnostic specialty enzymes market. For instance, in January 2016, Thermo Fisher Scientific announced acquisition of Affymetrix. Other prominent players in the global diagnostic specialty enzymes market include Amicogen, Inc., Amano Enzymes, Inc., Affymetrix, Inc. (Thermo Fisher Scientific, Inc.), and American Laboratories, Inc.